As the Christmas spirit blankets the bustling province of Pampanga, out comes the bright, festive lights that adorn the skyline. This is how Pampanga usually welcomes the Christmas season; with gleeful hearts and a thousand twinkling lights that form a bright star lantern atop homesteads. Perhaps the most renowned appearance of these lanterns is their larger than life counterparts that compete for the title of the most enchanting, the most festive, and the best among others. The Giant Lantern Festival has, for years, highlighted the creativity, innovativeness, and the invaluable craft that lantern makers have honed for decades. The Giant Lantern Festival has also become a venue for families and loved ones to get together and experience their rich culture with love and understanding. The festival itself also promotes camaraderie and unity among town members as they cheer on for their town’s bet. At the end of a tiring, yet jovial occasion, these giant lanterns come to wear several hats; personifications of an undying culture, results of hardworking game changers, and most of all, symbols of a season naturally and purposely dedicated for peace, love, and unity. 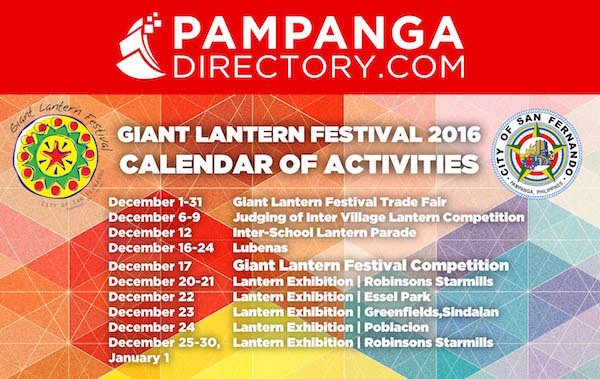 For that experience you won’t trade for any other, check out the Giant Lantern Festival’s schedule for this year below.